We have all been there and it feels terrible. That un-scratchable itch that seems to be somewhere on our face, but we just can’t find it. So we end up frantically scratching our beard and end up looking like a disheveled cave man with his beard hair going in every direction. Not a good look. Many beard itching issues can actually be prevented and fixed. Why is it So Itchy? There are many reasons a beard can itch. The first stems from beard hair growth in general. As hairs push out of the follicle, they are stabbing and pushing their way through your skin. Your skin does not like that and it causes a dull irritation that our brain translates as something to scratch and rid ourselves of. The closer the shave, the shorter the hairs are and the more intense the itching will be later on if you don’t keep shaving. For many people, those first few days are when all the hairs are forcing their way out. By days two and three, all hairs are in the process of growing out and the itch intensifies further. In addition to the hairs themselves, there are a few other causes of beard itching. First, dry skin from lack of moisturizing or cold weather can make the skin irritated and itchy. Chemicals in shampoos that aren’t made for the beard area can dry out and irritate the skin underneath. 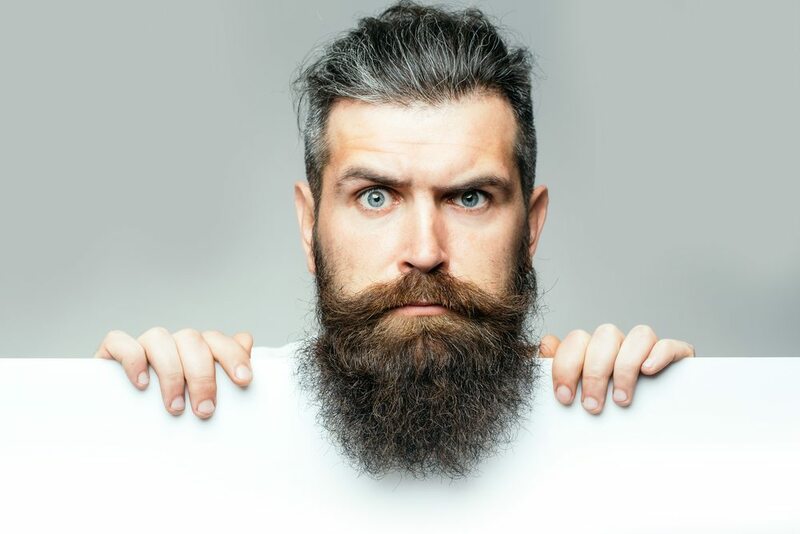 In-grown hairs can form if the beard isn’t brushed and given properly breathing room. If your beard wasn’t itching before… it is now. Sorry! Dry Your Beard to Moisturize It? While it sounds illogical, not drying your beard when getting out of the shower can actually dry it out even further. Most showers have what is called ‘hard water’, meaning it contains calcium and magnesium carbonates. It is not harmful to us, but if the water is not sufficiently dried off of the beard area, these minerals can actually draw the moisture out of the skin. Always towel dry your beard when getting out of the shower. If it is a large beard, break out the hair dryer to ensure it does not stay damp. Like the hair on your head, your beard hair needs to get cleaned as well. To avoid stripping the essential natural oils your hard needs to stay healthy, only shampoo once or twice a week. Conditioning can also help make your beard soft and more manageable. Only use shampoos and conditioners that are specifically made for beards. The pH balance and gentle skin care are needed to not cause dryness and more damage. Always rinse the beard properly to avoid residue. Combing your beard helps to stimulate hair follicles and get the blood flowing through the area properly. Weak and damaged hairs can also come out during the combing process, a little of which is advantageous since these types of hair can cause irritation. Combing can also train the hairs to grown a certain way, which is incredibly helpful if your beard tends to look a bit wild. If you are complaining about beard itch and not using beard oil, you must be crazy. Beard oil is like a miracle product. When our faces are clean shaven, we get a lot of moisture on our face through soap, lotions, shaving creams, etc. But once a beard is on our face, those moisturizing agents don’t get to the skin under the beard as easily. This causes advanced dryness and leads to more itching. By moisturizing your skin, it prevents this dryness. But this moisturizing also helps reduce the itch that is caused when the hair follicles are breaking through the skin. I use it every day, and sometimes twice a day when it is cold in the winter. After I dry off my beard when I get out of the shower, I comb my beard and then rub a few drops of the beard oil into my beard area. Once I massage it in for about 30 seconds, I brush my beard a bit more to further spread the oil, and I am good to go. It is a little nasty to think about, but our pillows actually collect a ton of dead skin cells, dirt, dust, bacteria… if you aren’t washing your pillows at least once a week, these gross things are ending up in your beard. Mine is getting itchy just thinking about it. A buildup of these things can clog pores, cause rashes, make your beard smelly and just lead to more all-around itching. Since we are taking such good care of our beard, we should also take extra care of the object that it rests next to for a third of the day. Previous article Can Stress Cause Hair Loss? Next article How to Deal with Hair Loss: Fight It or Embrace It?